Many newcomers like to purchase a completely new home in a new development building. Right now, New York City has a lot of these new developments. In Manhattan alone, there are over 140 new buildings on the market, from lower end to super luxury. Below, I would like to introduce you to some new condo buildings that I am personally very familiar with and like the most. Since there are so many new buildings on the market, if you have a specific need and a budget, please feel free to contact me to find the most suitable home for you. Central Park Tower - I have been invited by the top real estate developer Extell to preview Central Park Tower at its Sales Gallery. 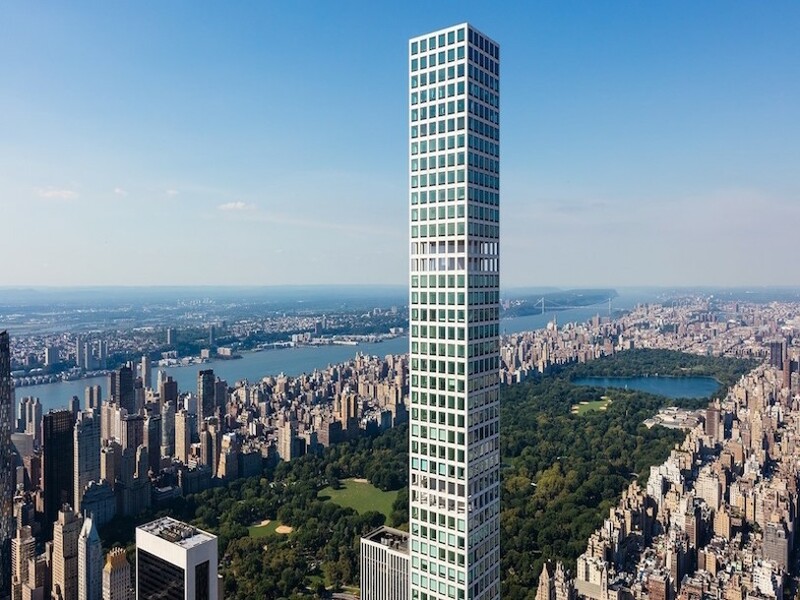 After its completion, this building will become the King of all residential towers in New York, and will replace 432 Park to be the tallest residential tower in the West Hemisphere. It is situated on the Billionaire's Row (57th Street). It is projected to be complete in December of 2019. The building will be 1550 feet tall, and has 50,000 square feet of amenities and 179 units. Each unit is designed to maximize the view and light. Generous size for every home, each luxury unit in this building will be suitable for spacious living and all types of party hosting. This area is the most expensive neighborhood, and has many High Net Worth Individuals from all over the world. This architecture is also combined effort and work of top architects and designers for 10 years. Central Park Tower is also called Nordstrom Tower, because at its base is a Nordstrom flagship mall. Currently, there are 2 bedroom, 3 bedroom, 4 bedroom, and 5 bedroom (full floor residence) for sale, from $6.5M to 62.75M. After you personally come to see this building, you will understand "This is Central Park Tower. This is Life at the Top." Introducing 30 E 31, One Bedroom, Two Bedroom & Penthouse residences with sophisticated interiors, expansive floor-to ceiling windows and breathtaking views. Expertly designed by Morris Adjmi from the inside out, this visionary tower paints an atmosphere beyond the façade. It has a 10-year 421-A tax abatement. Designed by Pritzker Prize-winning architect Jean Nouvel, 53 West 53 is like no other building in the world. High above the Museum of Modern Art, mere blocks from Central Park and Fifth Avenue, in the epicenter of New York’s global business, arts, theater and cultural districts, a modern, elegantly tapering tower is rising. Behind its striking façade are impeccably detailed residences designed by renowned interior architect Thierry Despont, each spacious and light-filled, with panoramic views framed unlike any before. The pinnacle of New York living. Spanning nearly five acres and built around a new landscaped park, Waterline Square is the culmination of a thriving riverfront neighborhood 25 years in the making, where Midtown meets the Upper West Side. Residents will have a life that transcends expectations with lush green space and new restaurants, markets, and retail outside their front door and over 100,000 square feet of sports, leisure, and lifestyle amenities. Introducing the first residences at Hudson Yards, offering a distinctive living experience – tailored design with five residence types and two design palettes, unparalleled amenities, a gracious lobby located directly on the Public Square and Gardens and breathtaking Hudson River views – all just moments from the creative energy of West Chelsea. Designed by Diller Scofidio + Renfro in collaboration with Rockwell Group, Fifteen Hudson Yards’ 88-story tower features an elegant silhouette, formed by four graceful arcs of glass, located on the High Line and adjacent to The Shed – New York’s forthcoming center for artistic invention. One Manhattan Square is an 800-foot tall modern glass tower located on the edge of the New York Harbor. With epic river and skyline views, these beautiful homes are wrapped by lush private gardens and over 100,000 square feet of indoor and outdoor amenities. A true vertical village. In the very heart of NoMad, where the elegance of uptown meets the energy of downtown, 277 Fifth Avenue soars toward the clouds. Designed by internationally acclaimed architect Rafael Viñoly, with luxuriously appointed interiors by Jeffrey Beers International, the commanding 55-story tower offers 130 distinguished one to four bedroom residences showcasing thrilling panoramic views of the Manhattan skyline, including the Empire State Building, the Chrysler Building, the Flatiron Building, One World Trade, and beyond. With a distinguished Fifth Avenue address and an ideal NoMad location at the epicenter of Manhattan’s most sought after restaurants, parks, shops, and hotels, 277 Fifth Avenue residents are poised to enjoy the very essence of what makes living in New York extraordinary. The Kent, a tailored collection of elegantly appointed condominium residences on the Upper East Side, crafted by award-winning architects Beyer Blinder Belle and acclaimed interior designer Alexandra Champalimaud. Two-to-five bedroom gracious residences exhibit the finest finishing details, complemented by three levels of curated indoor and outdoor services and amenities. Eligible for 20-year 421A Tax Abatement. 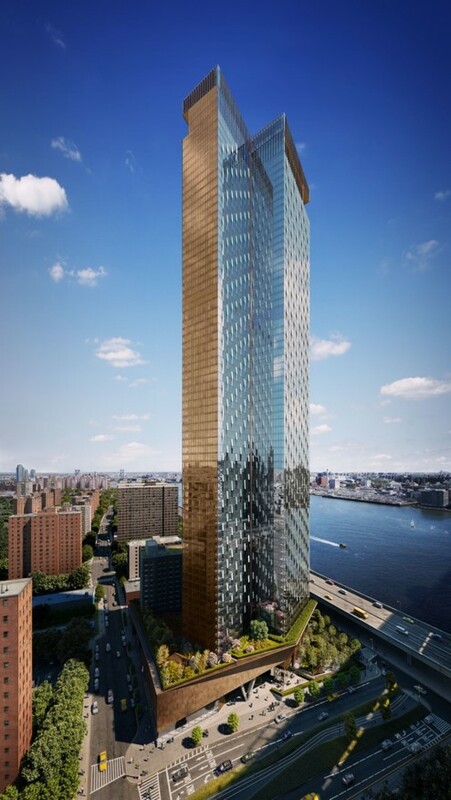 125 Greenwich is a new residential skyscraper designed by world-renowned architect, Rafael Viñoly. This condominium offering includes 273 residences ranging from studios to three-bedroom and penthouse residences, featuring one-of-a-kind interiors by March & White. The crowning triplex of amenities – located on the top three floors, 912’ into the sky – spans dining, entertainment, fitness, pool and spa, each with sweeping views of the New Downtown below. Enjoy the view. Located on Park Avenue between 56th and 57th Streets, 432 Park Avenue is the tallest residential tower in the Western Hemisphere. 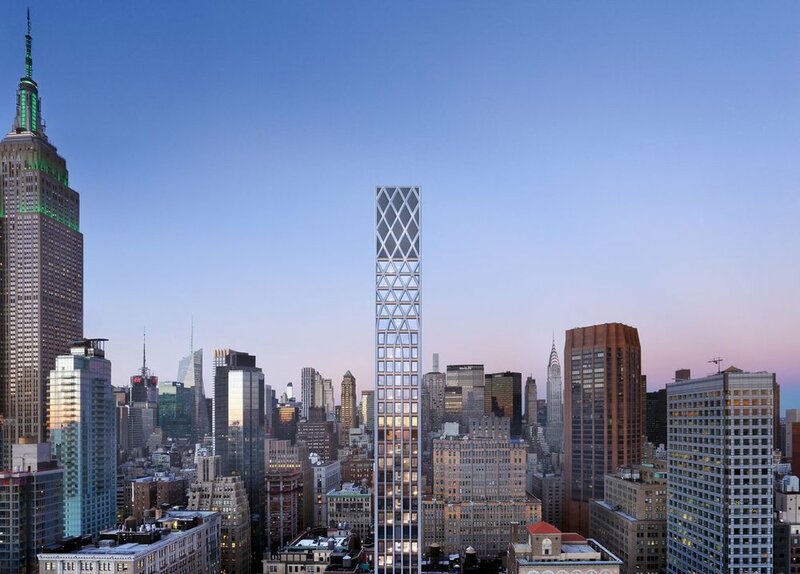 Designed by Rafael Vinoly, this extraordinary 96 story tower rises 1,396 feet and redefines the Manhattan skyline. All windows measure an expansive 10 feet by 10 feet, flooding residences with abundant natural light and spectacular views of Central Park, the Hudson and East Rivers, Atlantic Ocean, and many iconic Manhattan buildings and avenues. Residences feature 12’-6” finished ceilings, private elevator landings, service entrances, windowed eat-in kitchens, and large master bedroom suites with two bathrooms and adjoining dressing rooms. Rising to over one thousand feet above midtown Manhattan, ONE57 elevates New York living with the longest South-to-North views of Central Park ever offered in private residences. Walls of glass illuminate expansive homes of extraordinary scale and light. A lifestyle enhanced by the exceptional personal service of Park Hyatt’s new five-star flagship hotel. Pritzker Prize-winning architect Christian de Portzamparc creates a landmark among landmarks that has forever redefined luxury living in New York. Each residence has been meticulously planned with gracious layouts and wide dimensions. They boast oversized doors and soaring ceiling heights, providing a glamorous stage for entertaining guests. Expansive spaces that feature custom details, the finest natural finishes, and the most dynamic views of Central Park- ONE57 has redefined luxury New York living. A priceless Gramercy provenance together with a nuanced design narrative, 200 East 21st Street stands as a distinctive statement inspired by the romance of its neighborhood’s history, architecture, and parks. 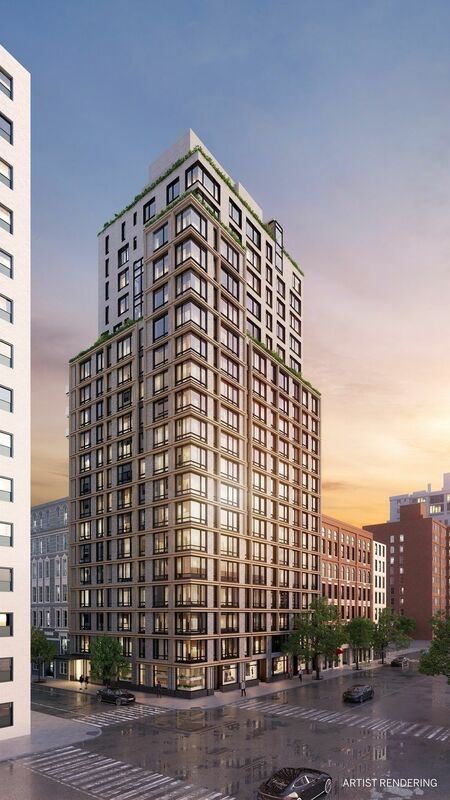 With an eye on a sustainable future within a coveted downtown location, 200 East 21st Street is the latest addition to Alfa Development’s Green Collection of properties targeting LEED-Gold Certification. With architecture by BKSK Architects, 200 East 21st Street takes essential cues from its storied past, mixing contemporary language with historical detailing; a perfect balance of technical ingenuity and design artistry—all on a human scale. While architectural depth overhangs gracious windows, light enters the space to shape modern lives and thoughtful living. Bespoke custom interiors by Champalimaud incorporate layered materiality, while thoughtful green spaces by Halsted Welles draw inspiration from neighboring Gramercy Park and connect residents with the outdoors for a holistic wellness experience. Anticipated Occupancy Late Fall 2018. One West End, a sculptural glass residential tower with exterior architecture by Pelli Clarke Pelli, rises elegantly above Riverside Center – Atelier Christian de Portzamparc’s master-planned neighborhood enclave. Featuring interiors designed by hospitality visionary Jeffrey Beers, the 42-story condominium tower offers 246 one-to-four bedroom residences including a curated collection of Penthouse and Tower Duplex homes. Commanding a full city block between 59th and 60th Streets at West End Avenue, One West End is home to expansive indoor and outdoor resort-inspired amenities.